The ancient art of preserving fresh produce is more popular than ever. Peter Piper was onto something. He supposedly had an appetite for vegetables preserved by a process of immersing them in a mixture of salt, vinegar and water, often enhanced with flavorful herbs and spices. But the popular tongue twister leaves us with a few unanswered questions. What kind of peppers? Banana peppers? Bell peppers? Jalapeños? And exactly how many pecks of pickled peppers did Peter Piper pick, anyway? All alliteration aside, the nursery rhyme reminds us of two of the many blessings bestowed upon the South—the long, sunny growing seasons that produce bounties of delicious fruits and vegetables, and the passed-down art of pickling homegrown crops. Many old-timers of the region relay stories from a time when pickling and preserving the summer and fall harvests yielded enough food to feed large farming families through the lean winter months. It was out of necessity that Southerners developed an array of poignant pickled products to wake up mundane meals and add a bit of panache to casual potluck suppers. Of course, pickling did not originate in the southeast, but Southerners are often credited with mastering the ancient food preservation method with recipes spanning well beyond pickled cucumbers and peppers. Beets, cabbage, beans, okra, tomatoes, carrots, peaches, watermelon rinds and more were deemed pickle-worthy. Today, pickled foods and their fermented cousins are the darlings of the culinary world. We are experiencing a pickling boom, and taste buds in the South and far beyond are delighted. In a true pickling scenario, food is soaked in an acidic medium like vinegar to achieve that much-anticipated texture and sour or tangy flavor found in things like dill pickles, pickled ginger and pickled beets. The process typically uses heat to destroy and inhibit the growth of any microorganisms. Though both processes yield nutrient-dense foods, fermented products boast the probiotic health and wellness benefits usually associated with A-list superfoods. Yet pickled products also offer wholesome perks, some of which might be surprising. Sea Island nutritionist and Pilates instructor Joyce Mattox, whose grandfather founded Mt. Olive Pickles in the 1920s, notes that pickle juice has become a popular after-exercise drink because it can help reduce muscle cramps. “It gives you the electrolytes that you need,” she says, adding that it’s ideal to drink it as soon as possible following a workout. Among the oldest forms of food preservation in the world, pickling and fermenting have been used by many cultures to store foods and add a punch of flavor to them. The earliest record of fermented fare stretches back to a time around 6,000 B.C. From Korean kimchi and Indian chutneys to sauerkraut, yogurts and cheeses, the diverse approaches have shaped unique flavors and traditions around fermentation. Pickled foods followed a different chronology. Both the New York Food Museum and Pickle Packers International offer historical timelines that trace pickling back to ancient Mesopotamians, circa 2,400 B.C. Some time around 2,030 B.C., inhabitants of northern India brought cucumber seeds to the area now known as southwestern Asia. Soon after, cucumber vines were taking root throughout the European continent as well, which prompted people to learn to preserve cukes in a salty brine. The word “pickle” comes from the Dutch “pekel” or northern German “pókel,” meaning “salt” or “brine,” which are two essential components in the pickling process. Pickles, in particular, have received much acclaim throughout history. In 850 B.C., Aristotle praised their healing properties and, 800 years later, Cleopatra supposedly dined on pickles and thought they contributed to her health and legendary beauty. Believing that consuming pickles boosted strength and stamina, Julius Caesar and other Roman emperors fed pickles to both the legionaries and gladiators. When Europeans first discovered what is now known as North America, pickled cucumbers came along with them. In 1492, Christopher Columbus reportedly rationed pickles to his sailors as they journeyed to the New World. The pickles helped stave off scurvy—a common disease caused by a vitamin C deficiency. In 1659, Dutch settlers began growing cucumbers in the region that is now Brooklyn. Viewed as delicacies, the cukes were sold to dealers who cured them in barrels to prepare them for sale throughout New York City. Throughout the 1600s, 1700s and 1800s, the popularity of cucumber pickles soared. Beyond the traditional cucumber pickles and peppers, pickled vegetables have recently emerged as one of the biggest culinary trends. “About 10 or 15 years ago, Southern foods became the big thing, and pickled vegetables are a natural extension of that trend,” says Mark Hungarland, co-owner of Doux South Pickles, an Atlanta-based company that produces an eclectic lineup of all-natural pickled vegetables for restaurants, resorts and grocers. “It’s an art that had all but died out because of the work involved and today’s access to grocery stores. But it was part of Southern culture and tradition, and recipes had been passed down from generation to generation.”According to the Department of Agriculture, Americans consume 9 pounds of pickles per capita each year. According to the Department of Agriculture, Americans consume 9 pounds of pickles per capita each year. And consumers still crave a connection with their food. 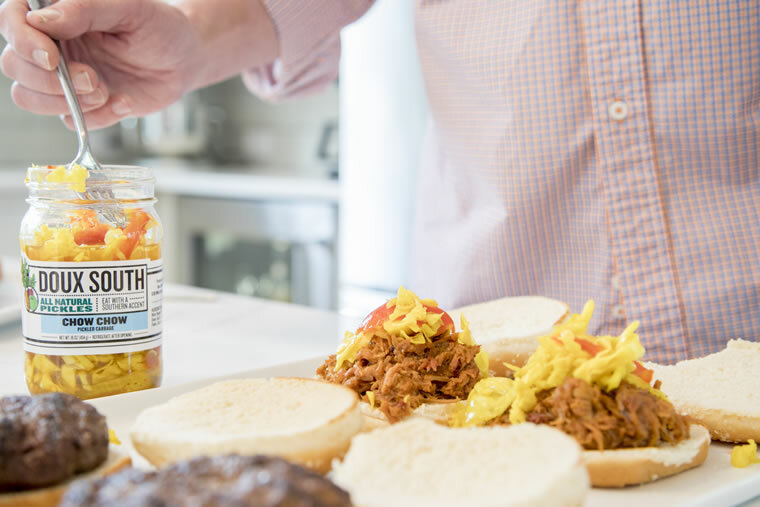 They like to know where their food is coming from, and they like the personal touch that pickled products offer—a nostalgic, artisanal, do-it-yourself feel that goes hand-in-hand with American and Southern roots. “The farm-to-table movement is an ethical, ecological approach to food, and pickling and fermenting foods are part of that movement, as well,” says Christopher Delissio, chef de cuisine at Sea Island’s Southern Tide restaurant. Kombucha, a fermented tea drink often referred to as “booch,” and other fermented beverages are now mainstream, with U.S. retail sales reaching about $556 million in 2017, up about 37 percent from the previous year. 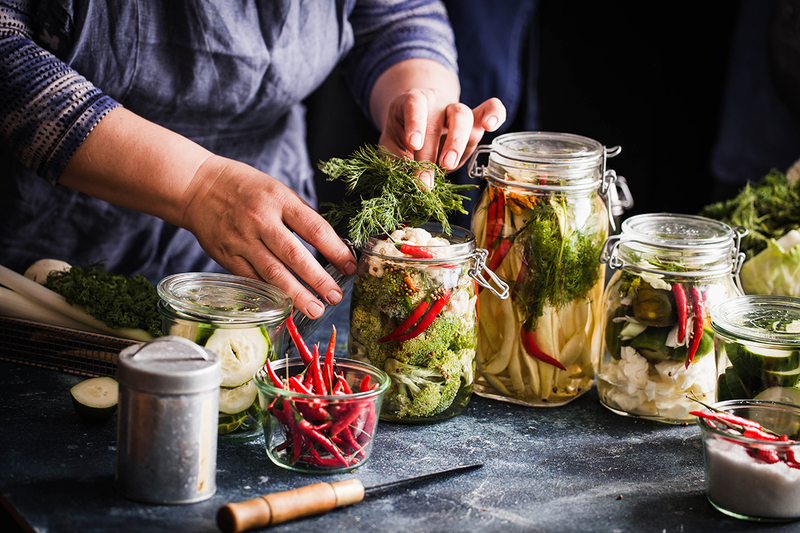 The public’s interest and desire to purchase pickled and fermented food products doesn’t seem to be slowing down. 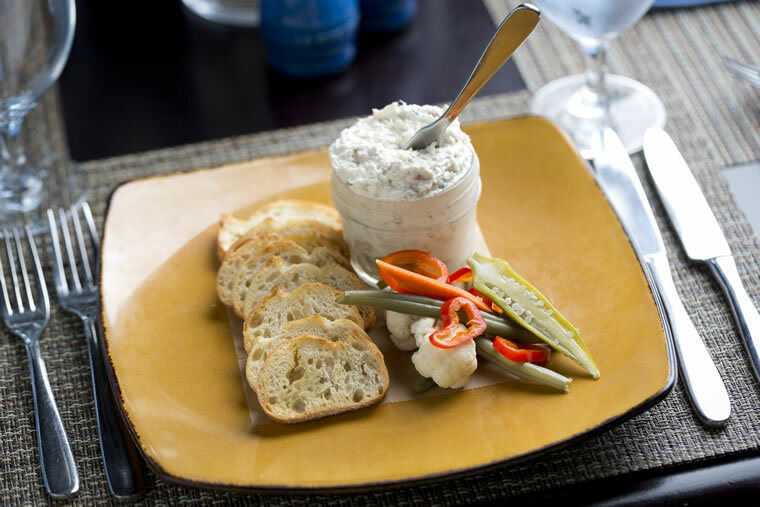 Pimento cheese is served with tangy pickled vegetables and crackers at Southern Tide. At the Southern Tide kitchen, Delissio blends his passion for food with an adventurous, creative flair, and the results please the diners’ palates. “One of my favorite pickled offerings on our menu is the pimento cheese served with Southern crackers and pickled vegetables,” he says. A match made in heaven, tangy pickled vegetables perfectly complement the sharpness of the cheese. Plus, the snap and crunch of a pickled veggie interrupts the cheesy texture between bites. “And our Southern Tide Burger is always well-received by guests,” Delissio adds. “It’s served with pickled red onions, as well as pimento cheese, smoky bacon and mustard sauce.” A dash of Delissio’s pickled pepper vinegar adds flavor and spark to greens, and grits are sometimes embellished with fried pickled okra. Even still, the chef says his personal favorite remains the fire-and-ice cucumber pickles. Like your grandmother’s pickles, with time, what’s old becomes new again. 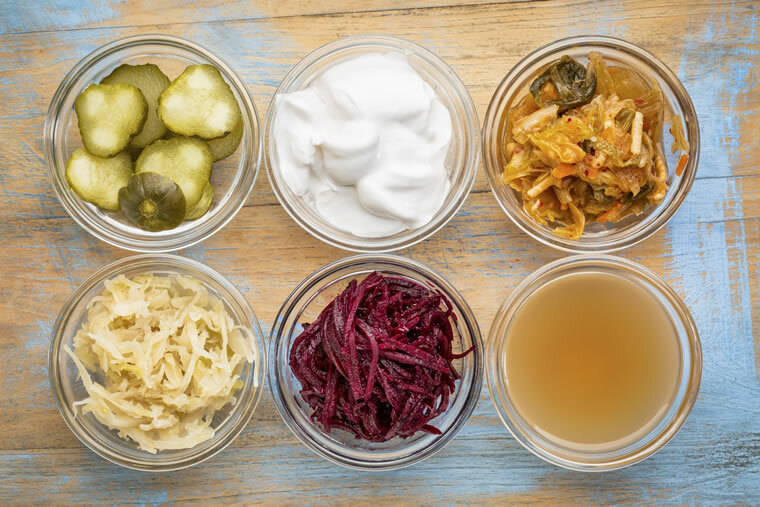 Pickled and fermented foods have moved beyond garnishes, condiments and afterthoughts. Though somewhat of a throwback to the fare preserved in dusty Mason jars, today’s pickles layer vibrant flavors and stand alone. Christopher Delissio, chef de cuisine at Sea Island’s Southern Tide restaurant, shares his recipe for perfectly pickled products. Place all ingredients in a pot and simmer for 10 minutes. Remove the liquid and place in the refrigerator to cool down. Strain before using.